Happy Navratri festival to all of you. 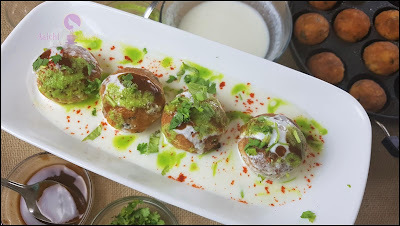 chatpata snack or breakfast that is fasting dahi vadas or dahi bhalla. These dahi vadas are healthy, tasty and top of all its non-fried version. Prepare these vadas in just 1 tbsp oil. 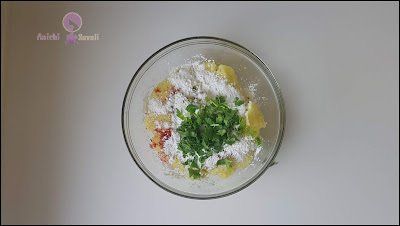 Dahi vada is one of the most popular snacks in India. 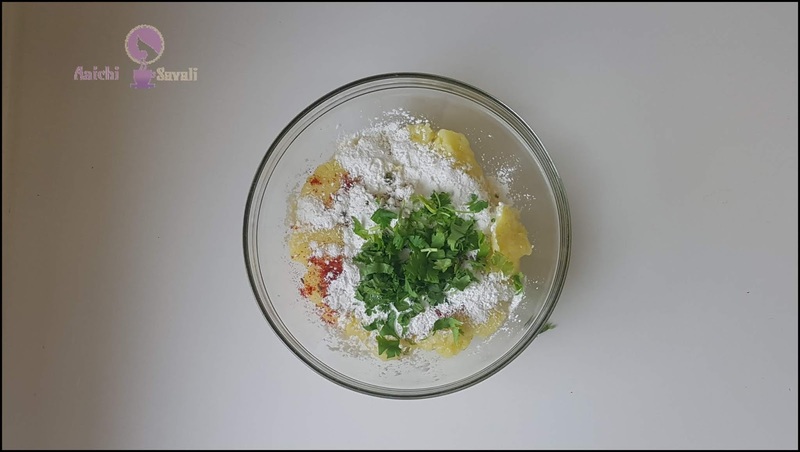 This Navratri I have tried different fasting food, and this dahi vada is one of them, prepared this dahi vada using potatoes. I used arrowroot as a binding agent. Instead of frying, I have prepared them in an appe pan and used just 1 tbsp oil. Then I served vadas with prepared creamy yogurt, fasting chutneys and garnished it with coriander leaves. Preparation Time: 10 Minutes; Cooking Time: 5 Minutes. 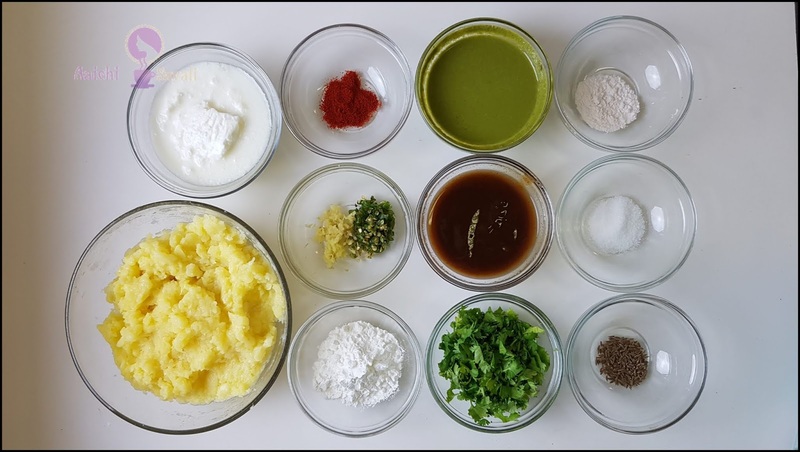 In a bowl combine boiled and mashed potatoes, arrowroot powder, green chilies, ginger, cumin seeds, red chili powder, salt, and coriander leaves. Divide the dough into equal portions and make small size balls and roll them in the arrowroot. Now, heat the appe pan over medium flame and add a few drops of oil in each of the grooves. Place the prepared small balls of the potato mixture in each of the molds. 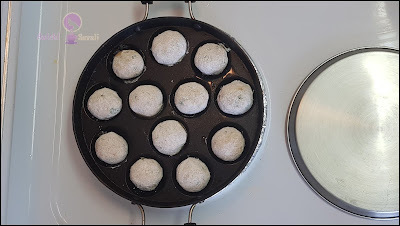 Cover it and cook for 2 to 3 minutes and when the underside begins to brown turn the vada to the other side. Flip the vadas over and allow it to cook on all sides evenly. As it cooks, continue to turn it until all sides are entirely brown. Meanwhile, In a bowl add yogurt, sugar, and salt and beat the yogurt until it turns creamy. In a plate place cooked vadas and pour yogurt, dates-jaggery chutney, and green chutney. Now, sprinkle red chili powder and salt to the pulp. Add fasting green chutney and coriander leaves. Tadaa, yummy and tasty upvasache dahi vade are already. Enjoy!!! You can use sabudana flour or varai or shingada or rajgira flour instead of arrowroot. You can deep fry the vadas or roll them into cutlets and shallow fry. If you think the curd is thick, you can add water or milk to make it thinner. Drizzle some more oil at intervals, only if needed or if the vadas are sticking to the sides of the pan. Per serving contains 40 calories, along with carbohydrates - 6.8 g, dietary fibers - 1 g, fats - 1.2 g, proteins - 0.57 g.
It is a good source of protein, and at the same time, it contains fewer calories. Arrowroot is gluten-free and can be used as a direct substitute for cornstarch for folks with corn allergies. A 1 serving of upvasache dahi vade has 40 calories and 1 g of dietary fibers. Minerals like calcium, iron and some others are contained by potatoes and yogurt which helps in the improvement of joints and bones. It is good to eat dahi vada for breakfast, lunch and evening snack.